Welcome to a four-part series where I will be unpacking some classical music for the holiday season. These are pieces that may or may not be familiar, but will definitely add holiday joy to your home! Sometimes Christmas sounding music doesn’t actually have anything to do with Christmas, and that’s the case today. I am including this piece in our December collection of Christmas classics because it sounds super Christmasy…it’s the kind of piece that’s delightful to have playing in the background as you bake cookies and decorate the tree (or if you are just ready for a break from Bing Crosby). Sergei Prokofiev was born in (what is now) Ukraine in 1891. He was on the front edge of the modern movement, which meant he loved to experiment with unusual chord structures that didn’t necessarily sound pleasing to the ears. He wasn’t afraid of dissonance (that’s a fancy music word for notes that clash when you play them together). Remember, the modern movement was all about breaking rules. Tradition was out the window, and composers were unleashed to create sounds that had never been heard before. Movies were a pretty new thing, and composing film scores was a really new thing. Lots of composers were anxious to throw their notes into the ring and see what this new-fangled genre was all about. (Oh, and I’m pretty certain “new-fangled” was a common term in Russia.) Prokofiev received a commission for a pro-Soviet movie titled Lieutenant Kijé, and he was immediately off and running. What he actually composed didn’t amount to much, but it was well received and he decided to expand the content into a suite, which is just a short collection of musical pieces that are related in some way. 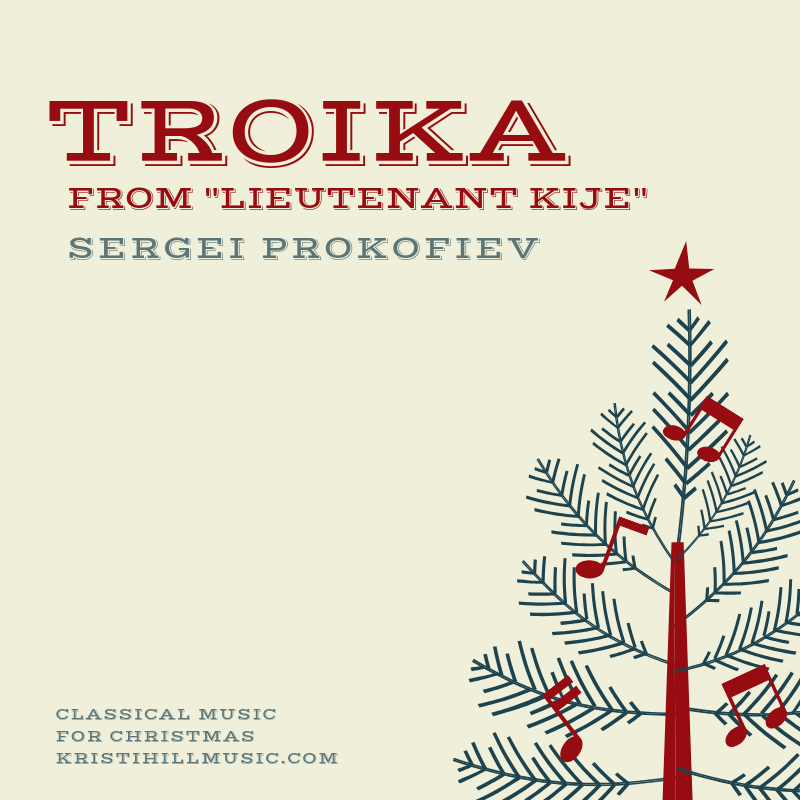 That brings us to our Christmas-not-Christmas piece for today: Troika from the Lieutenant Kijé Suite. A troika is a traditional three-horse drawn carriage (pictures here), so right away you can see where we are headed. Think, the classical music version of Jingle Bells. This is sleigh-bells-in-the-snow territory. Incidentally, this piece is not at all like what I described in the first two paragraphs. I suppose even modern composers’ ears needed a break from all that dissonance every now and then. Pour some hot cocoa and enjoy!